It was a warm evening in August and the room was packed at Bento Miso, a collaborative workspace for game and web developers nestled at the far west end of Richmond Street. There, the first-time female game designers involved in the Jeuxly (pronounced “July”) game development incubator were presenting their work. Programmers, writers, graphic artists, musicians, students, and players from all over Toronto’s gaming community had turned out to see the results of the six-week initiative, organized by Dames Making Games Toronto. They had also come to show their support for female game designers, who are a relative rarity in an industry often criticized for its negative attitudes towards women and general lack of diversity, both in the workplace and in games themselves. Stephanie Guthrie, who has faced intense hostility from certain corners of the gaming community, pointed out a slight and serious Asian girl and her mother. “She’s 14 years old and she loves games,” Guthrie said. “She loves to code—but she doesn’t really like the other kids at school, so she doesn’t get into coding activities with others.” The teen stood, arms crossed, surveying the room. “Her mother brought her here,” Guthrie continued, “to show her that lots of different people are into programming, all kinds of people make games.” All kinds of people, including women. Even though a number of women played pioneering roles in the early days of computer, arcade, and video gaming, for the last few decades there has been a scarcity of women in significant creative roles in the industry—this despite the growing number of women buying and playing all genres of games on all platforms. The latest figures from the Entertainment Software Association show that 47 per cent of women play video games, and that adult women represent a greater portion of the game-playing population (30 per cent) than boys aged 17 or younger (18 per cent). In the face of numbers like these, it’s not surprising that those who want the game industry to remain a male-dominated preserve are resisting inevitable change. This past summer, we’ve seen outrage against Anita Sarkeesian’s proposed video series analyzing games from a feminist perspective, sexist terminology in the description of certain cooperative gameplay modes, and assertions that sexual harassment is “just part of the game” when playing competitively. These attitudes towards women frequently extend to characters and dynamics within the games themselves. Organizations like Dames Making Games Toronto are trying to change that by providing workshops, seminars, and incubators in an attempt to bring a new generation of women game designers and programmers to the fore. Carver founded DMG Toronto in 2011 with Zoe Quinn, after they participated in a program called the Difference Engine Initiative (run by the Hand Eye Society in collaboration with TIFF Nexus). “We both found the process of making games so exciting and satisfying that we wanted to give the same opportunity to more women, as well as build a strong community of game-inclined women in Toronto,” said Carver. In December of that year, the two were panelists at the TIFF Nexus conference Women in Film, Games, and New Media Day. Through that conference they met many of DMG Toronto’s future supporters and collaborators, including Henry and Jennie Faber, who were just getting ready to open Bento Miso. “Zoe and I co-ran DMG Toronto’s first incubator, JAMuary, in January 2012 with significant support from Henry and Jennie,” Carver continued. “That incubator, as well as Jeuxly, was heavily based on the Difference Engine Initiative incubator model, and resulted in eight games.” In March, Zoe moved to Boston, and Jennie Faber and Alex Leitch stepped in to fill her shoes as co-directors. Faber and Carver co-ran Jeuxly with the help of many volunteers. 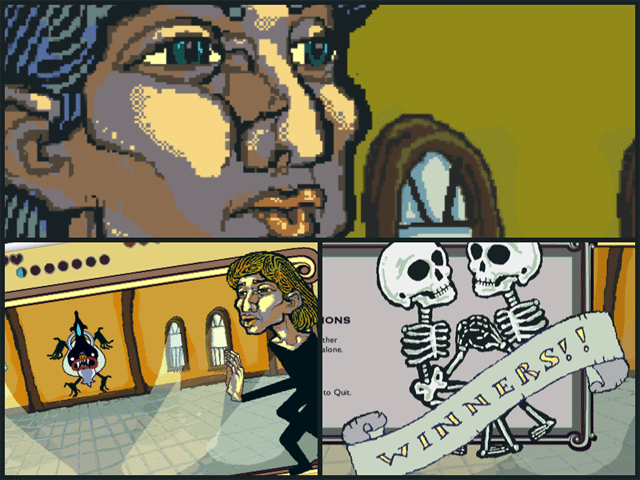 Now, after an intense six weeks, six new games and six new creators have emerged. Several of the games have immediately recognizable mechanics. Both the charming mythology-inflected Golden Fall (Yuliya Boublikova) and the sardonic sixties-styled Having It All (Miriam Verburg) are two-dimensional platform games. Une semaine de bonté: The Game (Julia Ediger) is a concentration-style memory matcher that uses the surrealistic art of Max Ernst. Cuddlegeddon (Gillian Blekkenhorst), an amusing look at communication in relationships, is a quirky variation on Pong. Bitmap (Christine Kim) has its roots in the classic snake game ubiquitous on last-century cellphones. Most unusual is Þink, pronounced “think” (Marie Flanagan), which uses familiar yet evocative planting metaphors to represent the cultivation of creative ideas from inception through to fruition. Most of the games were assembled in well-known game development environments like GameMaker and Stencyl. Ediger may have the least experience as a gamer in the group, but her background as a comic artist, illustrator and web developer has served her well. Her choice of Max Ernst as the visual touchstone for her game is intriguing, given that the images that Ernst used in his graphic novel were themselves cut up and reorganized from illustrations in Victorian encyclopedias and novels. Marie Flanagan’s Þink provides a whimsical look at the creative process, from dropping a seed into the open head of your creator, to using disembodied arms to fend off birds who want to steal the seed, to watering the seed to build its roots and ensure its growth. The next Dames Making Games Toronto incubator will be held sometime this fall. Game images courtesy of Dames Making Games Toronto.